Since its discovery in 1987 YBCO has established itself as the preeminent industrial superconductor. However, it has consistently resisted efforts to increase its critical transition temperature (Tc) much beyond about 105K. Superconductors.ORG announces the discovery of a structure type that facilitates an improvement in the Tc of YBCO beyond 175K (see above R-T plot). And, while the volume fraction derived from the method of synthesis is low, the profound Tc improvement again validates planar weight disparity (PWD) as a robust Tc-enhancement mechanism. Standard 91K YBCO (Y-123) has only 6 metal layers in the unit cell and very little PWD. In this new discovery - based on a 9223C theoretical structure type shown at left - there are 16 metal layers and a large amount of PWD. The closest analog to this structure type is the B212/1212C intergrowth of the Sn-Ba-Ca-Cu-O family, with Tc near 200K. The chemical formula of this new discovery - dubbed "Hyper YBCO" - is Y2Ba6Cu8Ox. However, HY-268 does not form stoichiometrically. 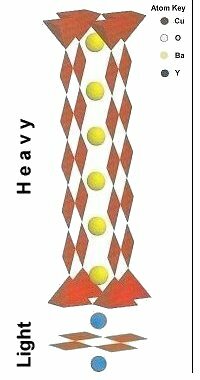 In order to synthesize a sufficent volume fraction to detect, the "layer cake" method must be used. 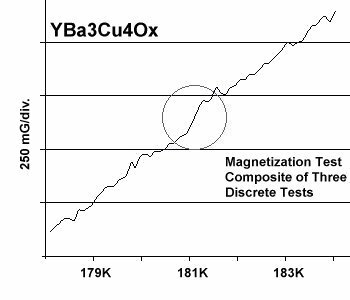 Below is a composite plot of three magnetization tests that were digitally summed to improve the signal-to-noise ratio. Weak diamagnetic transitions also appeared near 165K and 185K. These are believed to have resulted from minority phases: one less Ba-Cu layer for the 165K signal (7223C structure) and one more Ba-Cu layer for the 185K signal (B223C structure). These are the highest transition temperatures ever observed in a quaternary (four element) compound. Synthesis of HY-268 was by the solid state reaction method. Stoichiometric amounts of the below precursors were mixed, layered, pelletized at 70,000 psi and then sintered for 11 hours at 890C. The pellet was then annealed for 10 hours at 500C in flowing O2.